October 11, 2018. Community Impact Coach Rose Elias recaps her travels throughout Amman, Jordan and throughout Georgia in the cities of Gori, Ambrolauri, Tsageri, and Zugdidi alongside Coaches Across Continents in partnership with Reclaim Childhood, and the Ministry of Education, Sport and Culture. So about last September with CAC…. It finally came true! My month with CAC had started. Our first destination was Amman – Jordan. 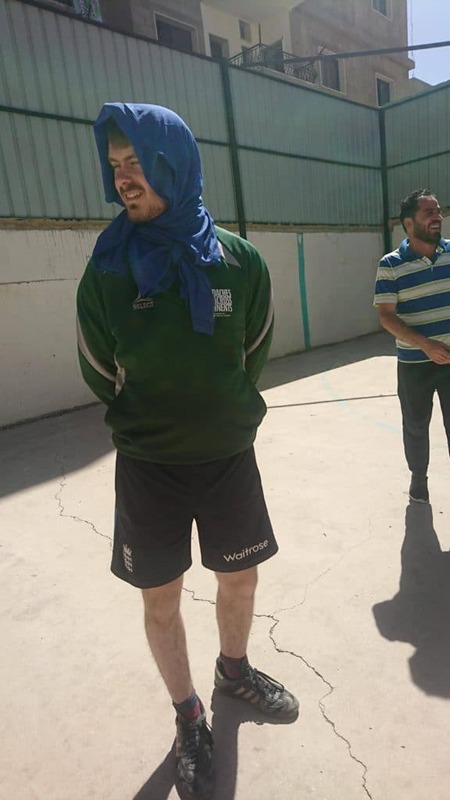 Our program in Jordan was interactive and fun. There, I met some very inspiring coaches and leaders in sports and sports for social impact. Through our partner Reclaim Childhood I had the chance to talk to some incredible women that decided to just go for it despite social pressures or gender roles. Also, amazing coaches from the southern Jordan with good hearts and generous souls. It felt good to be in Jordan because as an Arab I had the chance to experience another Arab culture; it was similar, different and interesting. Our second destination was Georgia, in partnership with the Ministry of Education, Sports and Culture. We had a big program in Georgia covering 4 different areas Gori, Ambrolauri, Tsageri and Zugdidi. It was overwhelming seeing Tbilisi another time, just because it is one of those cities you feel happy going back to. As we were moving from one location to the other we had to travel sometimes up to 3-4 hours by car. Never ending beauty through mountains and valleys, crossing rivers, experiencing Georgian hospitality as we stayed with two very warm families in Ambrolauri and Tsageri that made us feel like home. As high as the experience was, we also had to face big challenges during our sessions. I felt how hard it is for Women to achieve something different, social pressure is strong, it feels like it is hard for the younger generation. A lot of their needs are neglected because of social conformity and the rough nature of their lifestyles. It was not easy to observe and not feel some pain during this trip. On the other hand the Georgian culture is very rich and people have such strong connections with their neighbors, insanely generous and they are very happily living their clean, organic and literally fruitful lives. We tasted some top notch home-made wine, liqueur and an abundance of authentic Georgian cuisine. Life has been very generous with me, it offered me this CAC trip. I could feel my person growing every single day. 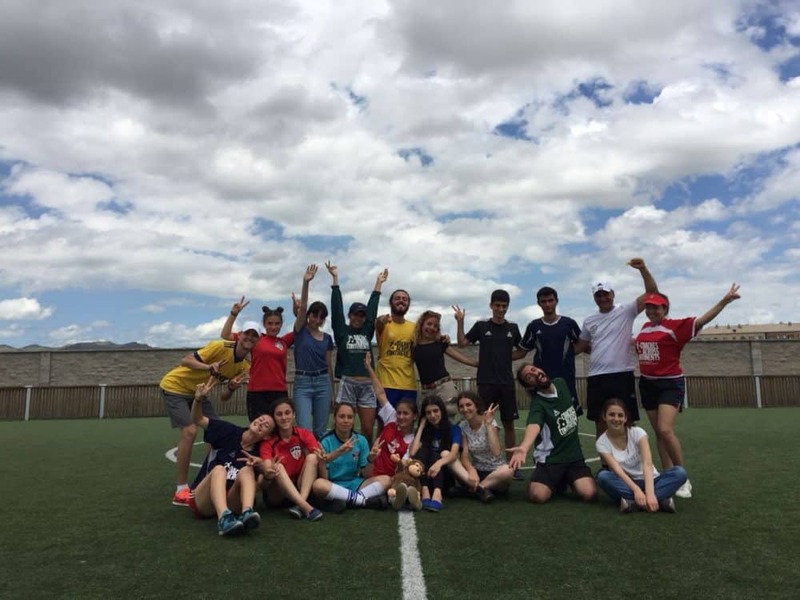 I learned a lot as a sports for social impact coach, I experienced two amazing cultures, Markus, Jesse, Toko and I were each other’s family, we cared and looked after one another. These moments will forever stay in my heart. My friends back home are telling me that my face is glowing! The secret behind this radiance is an unforgettable CAC trip that fertilized my inner-growth and showed me how powerful our work is. I can’t wait for what is coming. August 17th, 2018. 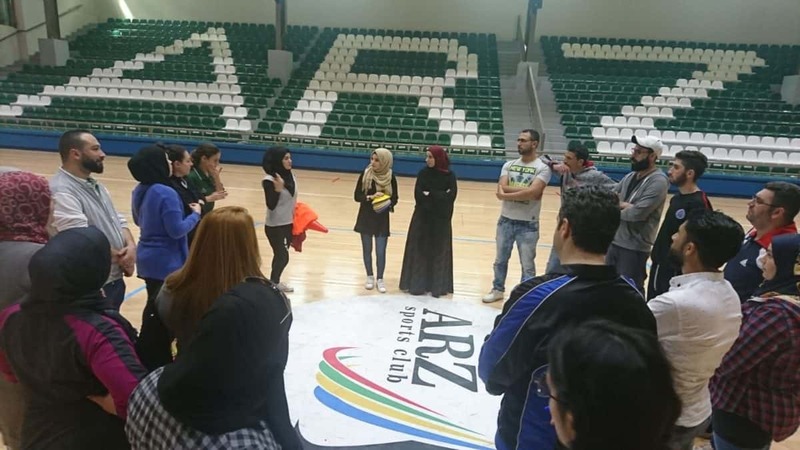 Global Citizen, Rosa Morales, writes about her experience working with ANERA and their team of Life Skills Trainers throughout Lebanon. Despite the image that western media attempts to portray, Lebanon is a country filled with diversity, where people, both old and new, coexist happily with their various religions and communities. With approximately seven million people inhabiting the small country, a long history of civil conflict, and the current refugee situation, Lebanon has a diverse history that isn’t quite like any other country. This rich history has even misled Americans into believing that Lebanon is dangerous and that tourists should refrain from traveling outside of Beirut, the capital. However, after traveling throughout the country’s many historical cities and meeting a tremendous variety of incredible people, I beg to differ. Working with ANERA (American Near East Refugee Aid), a nonprofit that continues to “help refugees and others hurt by conflicts in the Middle East live with dignity and purpose,” has opened my eyes to the situations that millions of people suffer from every single day. Coming from a privileged family, I have not had to worry about not getting an education, not being able to attain good health care nor clean water, or even be discriminated against in a community and country that you were forced to escape to. However, after spending eight days in this stunning country filled with such bright and beautiful people, I have come to the realization that we, the privileged, have to stop acting like these battles aren’t also battles of our own. ANERA, throughout Lebanon, from north to south, east to west, continuously provides safe havens for youth and teachers to go to in order to develop knowledge on their life skills, health and wellness, and overall rehabilitation in a foreign country with the help of Coaches Across Continents. Alongside this, they have connected thousands of Palestinian refugees to reliable sources of water, helped youth return to continue their education, as well as, renovating important structures, buildings, and organizations in their communities. Though, the real question is: When will YOU do something? People are always talking about wanting to do better for others, to see others achieve great successes, and practicing selflessness. However, they have not taken the initiative to actually do so. If you are in a position of privilege, it is important to realize that you have the ability to change a tremendous amount of people’s lives. In the greater scheme of things, the quote “help your neighbor” becomes incredibly prevalent. Your neighbors, peers, teammates, coworkers may all be undergoing some type of stressful situation that you could potentially help with. If you hear calls for help, whether they are subtle or more obvious, be there for them. ANERA and CAC have both contributed to this cause, but when is it going to be your turn? After spending a total of three weeks abroad, attempting to use sport for social impact in a variety of communities, I have broadened my knowledge and witnessed those who fight wars much harder than any battle I have had to face in my lifetime. There are people who are surviving off of nothing, when I have been living, thriving with objects that these same people may yearn for but may never see. It is time to give back to those who have faced enough hatred, trauma, and discrimination for the rest of us. Thus, I encourage you to lend out a helping hand for human kind and change the world one day at a time. August 6th, 2018. 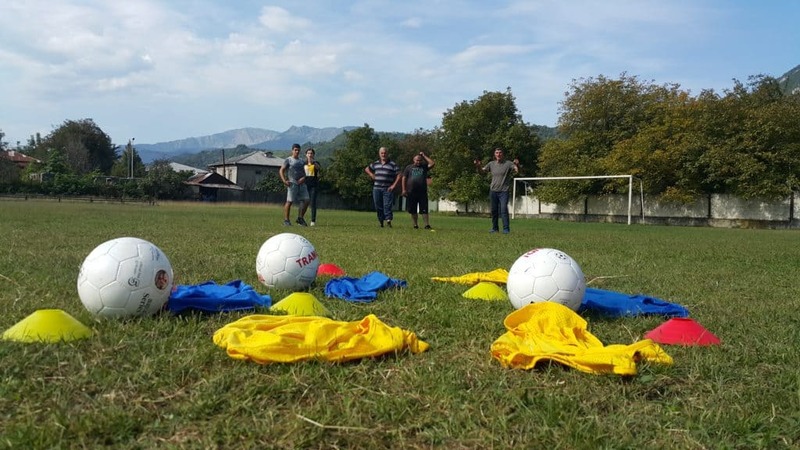 Community Impact Coach, Jaffar al Shishani, writes about his experience working with Coaches Across Continents in Armenia and Lebanon with GOALS Armenia and ANERA. Getting out of your comfort zone is not as easy as I thought it would be. After the last two weeks in Armenia and Lebanon with CAC this was the first thought that crossed my mind. Coaches Across Continents made it possible for me to explore new opportunities and deal with different cultures by applying a method based on creating a safe space where coaches and participants can be free to try, apply and exchange ideas. This safe space allows both sides to grow together and gain experience. Being used to working in Fencing, an individual competitive sport, the experience with CAC was a very important chance for me to concentrate on different goals, and especially to reconsider the social impact and the power that sport can have to change society. One focus of our work in particular was on women rights and the use of sport to empower women. Learning and applying CAC methodology also increased my own awareness of the constant violation of women rights in society, and gave me a different perspective on the subject. 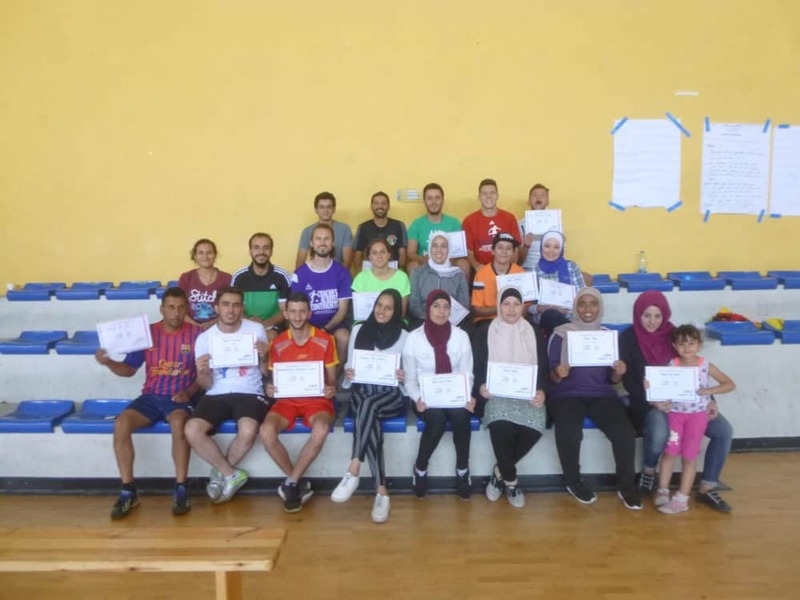 This kind of awareness will be very valuable and helpful in my development as a coach and I will try my best to use it to work for a change in my own country of Jordan. The desire to create a more equal society in my environment was a strong motivation to take part to this program in the first place, and CAC provided the safe space that I needed to develop ideas and strategies to work in this direction. April 18th, 2018. 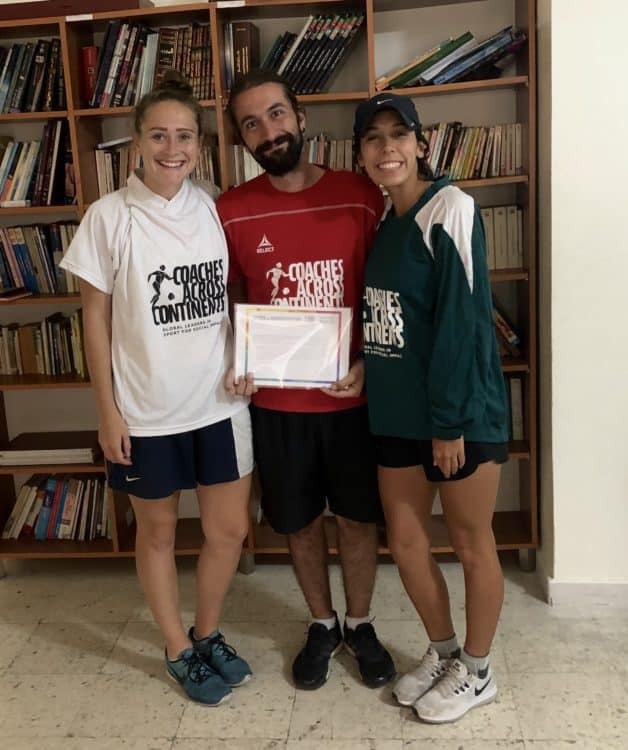 Community Impact Coach, Lorik from GOALS Armenia, writes and reflects on her experience working with ANERA in Lebanon. As a Community Impact Coach, I joined Jordan from CAC in Lebanon. On the third week of training, we moved from the seashore to the mountainous region of Zahle. The taxi driver who took us to the region was very kind and stopped every now and then to allow us to take some photos of the beautiful view. Later on, we arrived in Zahle; we were staying in the area of Maronite Christians, which was surrounded by statues of St. Charbel and Maryam. We descended towards the lower part of the mountain to Saadnayel, which is the beginning of the Muslim region – and where we were holding our training. 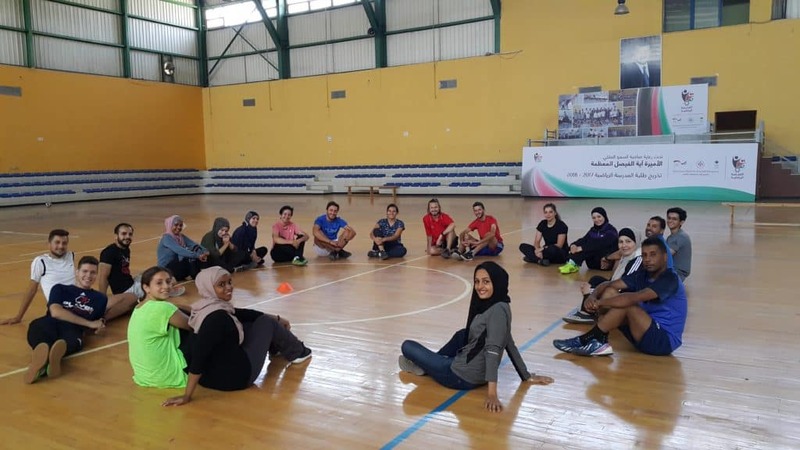 The participants of the training were of different nationalities, including Palestinians and Syrians. They had different backgrounds, cultures, religions and beliefs. Seeing past each others differences is one of the most important factors in life skills through sport for social impact games. There were challenges in implementing the games because of cultural difference and the interaction of both genders; the problem was solved by using alternative methods – ex. tagging or holding hands through use of the bibs. During the first day, men were playing very rigorously during the games, which made women want to sit at the back and not show any willingness to participate. By bringing this issue up during discussions and asking for solutions, they agreed on equal participation. During one of the coach back sessions, the participants had set a rule where only the women could score a goal. This demonstrated good progression of the group. One of the participants who motivated me was a lady called Mirna, who was born with a disability because of the relative marriage of her parents. She is a Ph.D. student who is studying NLP. She is Palestinian and living as part of a minority group in Lebanon. Observing different kinds of discrimination, she spent most of her childhood in hospitals and at home. She overcame her isolation with the help of her psychologist by setting life goals. She is a life skills instructor, a psychologist, and a role model for many of her students. Obtaining experience in coaching different groups of cultures and religions allowed me to better understand their mentality, and it facilitated the sharing of ideas and knowledge. It was inspiring to see and meet different people who thrive to provide equal opportunity for their students and provide a safe space for them to express their opinions. April 12th, 2018. 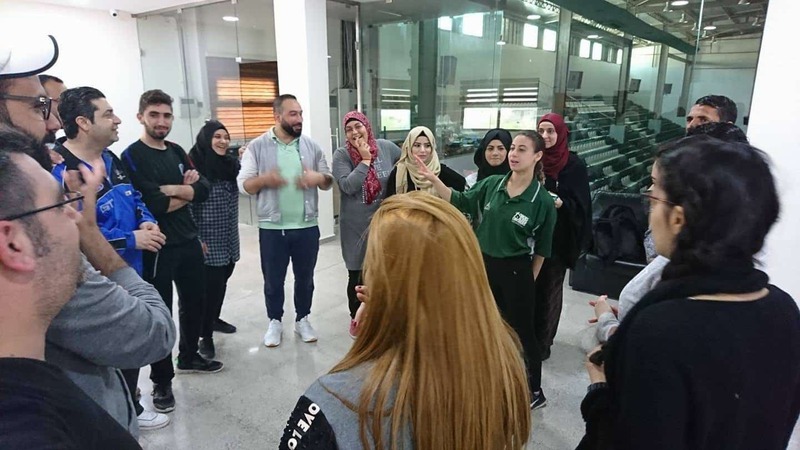 Self-Directed Learning Educator, Jordan Stephenson, writes about his second visit to Lebanon working with Corporate Partner ANERA (American Near East Refugee Aid). Arriving in Lebanon for my second time representing Coaches Across Continents was a great thrill. 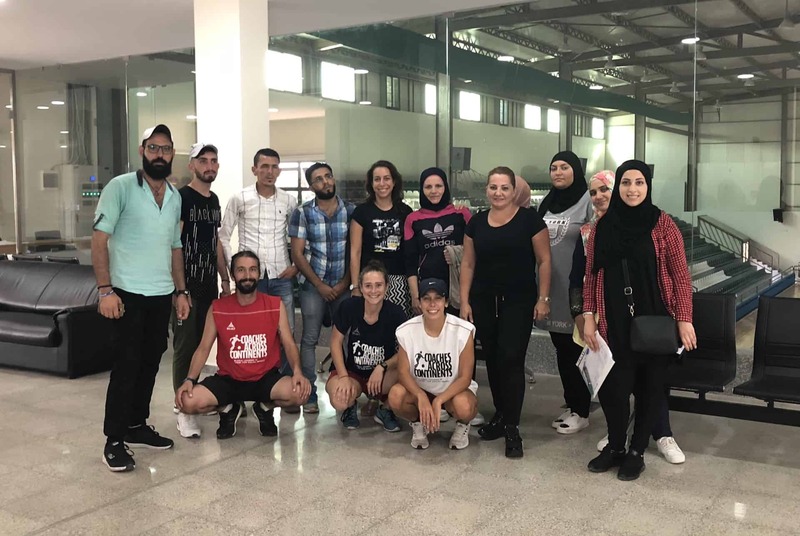 Having experienced the hustle and bustle of Beirut previously and worked with some incredible people with our partner Anera (America Near East Refugee Aid), it was now time to work with the local NGO’s which Anera support. We are delivering Life Skills training to teachers working in refugee communities. The programme works with youth aged 14-24 years old who have not been in education for more than 2 years. Our Education Outside the Classroom methodology is allowing more young people to access vital skills relating to employment [even though it’s virtually impossible to get a job anyway if you’re Palestinian or Syrian] and becoming a better citizen. Most of the teachers are living and working in the Ein el Helwe refugee camp. It is the largest refugee camp in Lebanon with over 120,000 people. It has high media presence because of gun violence and death rate due to the lack of Lebanese authority. It is known as the “no-law zone” because Lebanese police have no jurisdiction in the camp and therefore the community runs themselves. The training brought to life our curriculum as well as giving me a greater understanding to the challenges which people face here, both whilst using Education Outside the Classroom and in their lives. We have two more weeks of training in different locations across the country and I am excited to continue to spread the community legacies which Coaches Across Continents are involved in!